You’ll hear no complaints from me when the Ride of the Week can make the following claim: under the hood of this little sedan is the most powerful production 4-cylinder engine in the world. 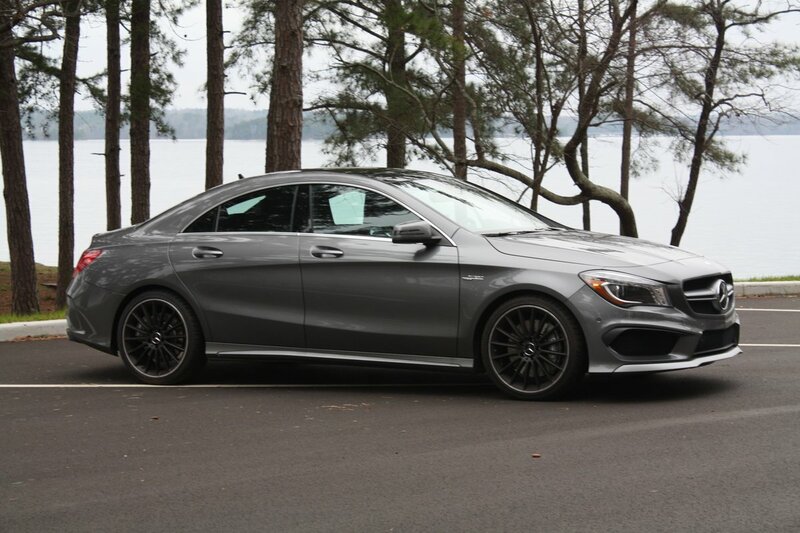 The 2014 Mercedes-Benz CLA45 AMG builds on one of the luxury brands newest models, the compact CLA sedan. It’s another so-called “four-door coupe” that joined the luxury automaker’s lineup late last year as a 2014 model. With a base price of $29,900 plus a $925 destination charge, the CLA250 is the most affordable model from Mercedes. 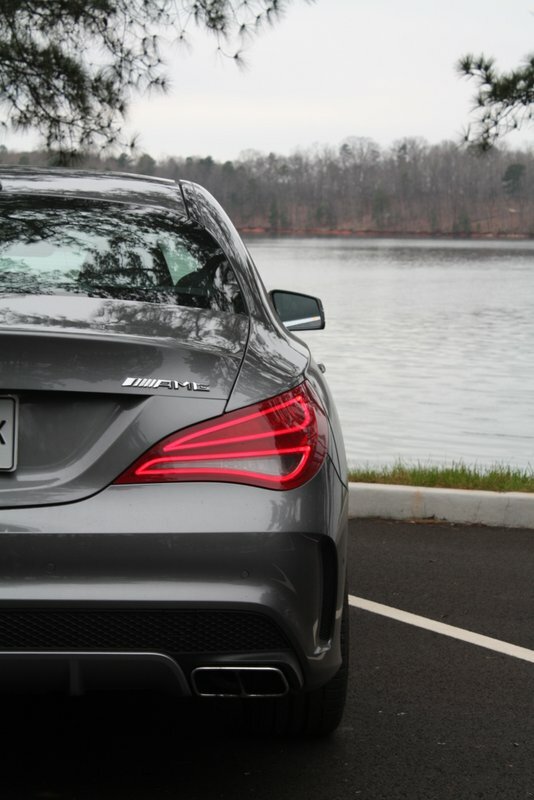 With the record-setting engine and an as-tested price of $57,165, the AMG version plays a whole different game. What do you get for nearly twice the money? A whole lot more power, to start. Although both models use a 2.0-liter turbo four, the AMG car produces 355 horsepower to the CLA250’s 208. More torque is available, too, with 332 lb-ft for the AMG versus 258 lb-ft for the base CLA. Each AMG motor is hand-built according to AMG’s “one man, one engine” ethos. 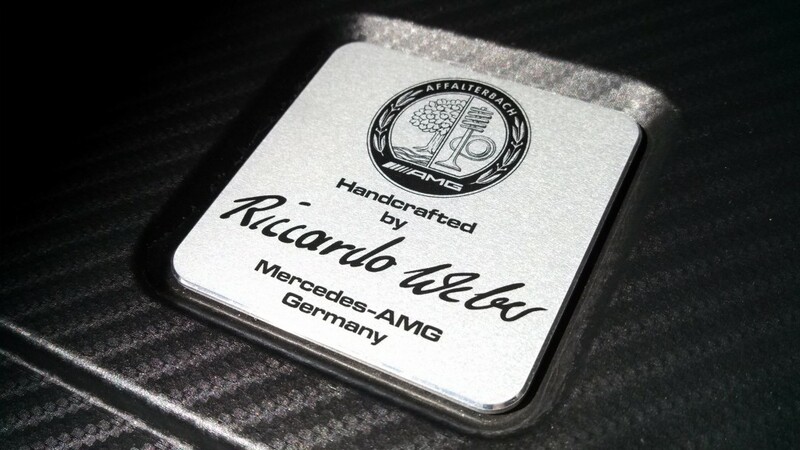 The test car’s badge atop the engine cover identifies one Riccardo Weber as its craftsman. Both base and AMG versions of the CLA get a 7-speed dual-clutch transmission. All-wheel drive is standard for the CLA45 AMG. The base CLA250 is front-wheel drive, although a 4MATIC version of the CLA250 is arriving in Mercedes showrooms now. Other mechanical enhancements include a sport suspension, big brakes and a launch control function that I was too timid to sample. Mercedes claims the CLA45 makes takes just 4.5 seconds to sprint from to 60 mph, a figure that sounds reasonable given the car’s power, all-wheel drive and quick-shifting dual-clutch automatic. The CLA250 is sporty enough in appearance, but the CLA45 is even more aggressive. Front and rear fascia treatments, grille, rockers, quad tailpipes and 18-inch wheels reveal the AMG model’s performance potential. 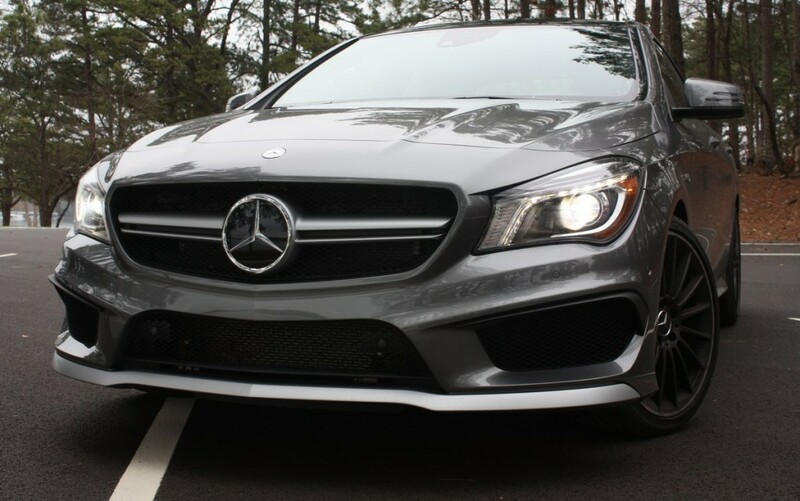 This CLA45 AMG test car includes a range of high-end equipment and features, but most are stand-alone options or included in packages that add nearly $10,000 to the bottom line. A premium package brings dual-zone automatic climate control, harman/kardon premium sound, heated seats and more for $2,300. Navigation is part of the $2,370 Multimedia package that also includes a backup camera. The test car also came with a $1,480 panoramic sunroof and a pair of Recaro sport seats that are worth every penny of whatever Mercedes charges for them. These are among the most supportive sport seats I’ve experienced. A low-profile design maximizes rear-seat legroom, and the look is decidedly racy. Although it’s not a large car, comfort is top-notch, thanks to smart design and ergonomics. One shortcoming is a large gap between the front door panel and B-pillar that reveals unsightly spot welds. 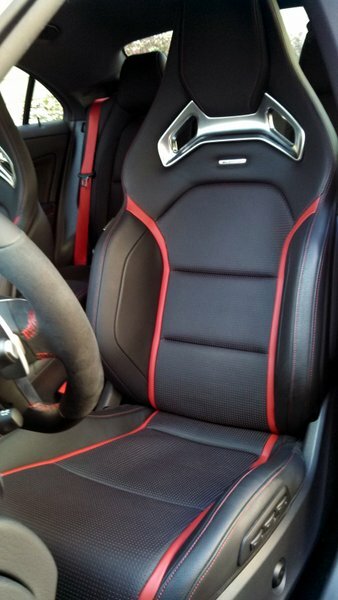 Otherwise, interior fit and finishes are excellent. In normal driving using the “comfort” transmission mode, the CLA45 is composed and efficient. A start-stop system even shuts down the engine when stopped in traffic – more on that in a moment. If not for the firm suspension, a conservative driving style fails to reveal the CLA45 AMG’s go-fast capabilities. 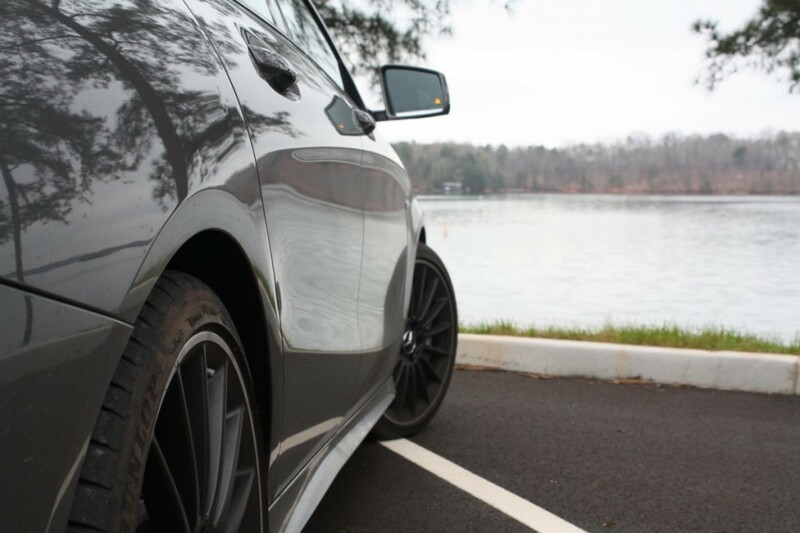 Use “sport” or “manual” mode, though – along with a heavy foot – and the car comes alive. Acceleration is exhilarating, made even more dramatic by the non-linear performance of the turbocharged four. The sound is wonderful, especially during up- and downshifts. Both braking and handling are impressive. Hot laps on a closed course may begin to expose the CLA45’s performance limits. But despite trying, I didn’t get anywhere near them. Everyday efficiency isn’t likely a huge factor for drivers considering a nearly $60,000 compact performance sedan. But CAFE standards mean automakers still pay attention. That explains smaller-displacement turbocharged engines for cars like the CLA45 AMG, as well as its aforementioned automatic start-stop function. Always sweating the details, Mercedes has one of the best; it lets the driver control engine stops and starts with the brake pedal. Come to a complete stop and press down hard on the brake to stop temporarily stop the motor. When you’re ready to go, lighten up pressure and the engine fires up promptly. The added control allows the driver to easily dictate when the engine should stop, or when it should start in preparation for take off. Sixty grand is a lot of money for a CLA. But for a brand new AMG model, it’s a bargain. This mini-monster earns high marks for outstanding performance, everyday practicality and high-quality interior appointments. The price is high, though. The same money will buy a slightly used E63 AMG that’s bigger and more powerful. Alternately, the CLA250 is especially compelling now that Mercedes offers all-wheel drive for the model.